It is not surprising that zoom oculars for astronomical telescopes are becoming increasingly popular. Zooms are hot sellers. They are affordable, convenient and tremendously improved from the bad old days when serious amateur astronomers would not be caught dead with one. Most major ocular brands now offer a 3:1 ratio, mid-range zoom eyepiece. The Celestron, Meade, Tele Vue and Vixen zooms all offer a focal length range of 8-24mm. Astronomy and Photography has previously reviewed all of these zoom oculars and these reviews can be found on the home (index) page. In this article, we will limit ourselves primarily to comparative comments. A zoom ocular allows you to view any object at a variety of magnifications, fields of view (FOV) and exit pupil sizes. You can set it for the best view allowed by the observing conditions of the moment, an advantage over fixed focal length oculars. 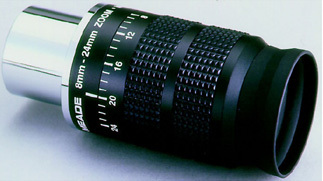 A zoom eyepiece does not, however, make fixed focal length oculars in its focal length range redundant, as some inexperienced buyers assume. Zooms are handy for determining the correct eyepiece focal length that the subject and seeing conditions will allow. Zooms allow the observer to fine tune the exit pupil to obtain the best overall contrast, especially when using nebular filters. They are also useful at star parties, or anytime that more than one person is sharing the same telescope. Zooms allow the observer to see the subject at different focal lengths without the hassle of changing oculars. When viewing an astronomical object, a typical eyepiece progression might start with a 32mm ocular, which is used to find and align the scope on the object. Next, a zoom ocular allows the viewer to select the magnification, field of view and exit pupil most appropriate for the object under the existing seeing conditions. Finally, the zoom can be replaced by an equivalent fixed focal length ocular for critical observation, if required. The optical designs of the zooms that are the subject of this comparison are interesting. They are all fully multicoated. The Celestron zoom design uses four elements in three groups and is quite different from the others; no ED glass is used in the Celestron zoom. The other three claim seven elements in four groups. These incorporate a rare earth Lanthanum glass element. All have chrome-plated 1.25" diameter mounting barrels that incorporate wide safety grooves. The Celestron 8-24mm zoom weighs 7.9 ounces, as does the Vixen NLV 8-24mm Click-Stop zoom, while the Tele Vue 8-24mm Click-Stop Zoom weighs 7.6 ounces and the Meade 8-24mm weighs 7.0 ounces. The Celestron, Meade and Tele Vue zooms are all supplied with folding rubber eyecups, while the Vixen features a superior twist-up rubber eye guard. Typical 2009 online discount prices of the (discontinued) Tele Vue Click-Stop Zoom is $210-$240 and the (currently manufactured) Vixen NLV Click-Stop Zoom is $189-$220. The Meade Series 4000 Zoom runs $125-$130 and the Celestron Zoom is only $60-$65. Be advised that the various manufacturers do not provide the same set of specifications for their zoom oculars. What follows is what we have been able to piece together from various sources. Here are the product specifications for the Celestron 8-24mm Zoom. Celestron 8-24mm Zoom Eyepiece. Photo courtesy of Celestron International. 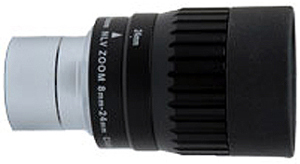 Here are the product specifications for the Meade Series 4000 8-24mm Zoom. 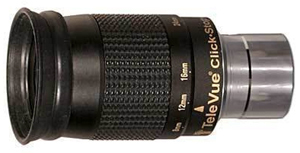 Here are the product specifications for the Tele Vue 8-24mm Click Stop Zoom. Here are the product specifications for the Vixen NLV 8-24mm Click Stop Zoom. Vixen 8-24mm Click-Stop Zoom Eyepiece. Illustation courtesy of Vixen Optics. Our visual comparisons were made using a Celestron Omni XLT 102ED refracting telescope with a 900mm prime focal length. Overall, contrast and center sharpness were very good, better than expected, in all of these zoom eyepieces. Their daytime color rendition was similar, but not identical. However, they all looked good and we could not positively determine which was the most accurate. (Maybe the Click-Stop zooms?) These zoom eyepieces are suitable for use in practically all amateur telescopes for either astronomical or terrestrial viewing. On the negative side, their restricted apparent field of view at the long focal length end can be a problem for finding faint objects, as well as for viewing extensive subjects, such as the Andromeda galaxy or the Double Cluster. There is some noticeable loss of sharpness as you look toward the edge of the field of view with almost any ocular and this is particularly true of these zoom oculars at all focal lengths. The various optical aberrations are also usually more pronounced at the edge of the field of view, further reducing the quality of images formed at the edge. However, few observers concentrate on the edges of the field of view, so whatever loss of sharpness occurs there is likely to be unnoticed, or at least tolerable. We judged all of our zoom oculars to be acceptable over most of their field of view, but gave the nod to the Tele Vue and Vixen Click-Stop zooms for having the largest useful AFOV at all focal length settings. However, none of the zooms performed as well in this regard as premium fixed focal length eyepieces, which generally present a flatter field. Zoom eyepieces are understandably popular for use in bino viewers. For this purpose, the Tele Vue and Vixen Click-Stop eyepieces are the best choices. It is very hard to read the focal length markings on zoom oculars at night and harder still to set models without positive click stops to exactly the same focal length. The click stops are a practical necessity for bino viewing and a considerable convenience for everyone else. It is great to be able to count the click stops and know where your zoom ocular is set, without turning-on your red flashlight and looking at the eyepiece. The Tele Vue Click-Stop Zoom accepts Tele Vue DIOPTRX astigmatism correction lenses. These allow eyeglass wearers to view without their glasses, a feature that could be important to some users. Instead of the DIOPTRX ring, the Vixen Click-Stop Zoom has a twist-up eye guard that can be adjusted for comfortable viewing. This is more convenient to use, as well as more effective, than the simple rubber eyecup that graces the other zooms and the majority of users will appreciate the pull-up eyecup more than the DIOPTRX feature they will never use. In other respects, the Vixen and Tele Vue 8-24mm zooms are virtually identical. The Meade Series 4000 zoom falls into what might be called the medium price class and its overall construction and performance seemed consistent with this assessment. Its optical design is sophisticated and it appears to be well made. It is visually very close to the Tele Vue and Vixen zooms in performance. It is Meade's quality control, or lack of same, that probably accounts for most of the difference in price between it and the Click-Stop zooms. The Meade 4000 is a viable choice as an all-around zoom ocular. The Celestron zoom is the bargain eyepiece in this comparison. Yet, despite its simpler design, its optical quality is (visually) very close to the other contenders, a tribute to good manufacturing. There is probably a lesson in there somewhere: execute a simple design correctly and it may be competitive with a complex design that is harder to manufacture. (If only we had access to an optical bench, so that we could "split hairs." -Editor.) The Celestron zoom appears to be well made, although not in the same class as the premium Tele Vue and Vixen zooms. The Celestron is not as smooth in operation as the premium eyepieces and it is noisier when the zoom ring is rapidly turned from 8mm to 24mm. However, it is much less expensive than the other zooms and performs well, making it the standout in the "bang for the bucks" arena. If your Chancellor of the Exchequer is a bit tight with funds, buy the Celestron 8-24mm zoom and never look back. Our subjective impression is that the Vixen and Tele Vue Click-Stop zooms are mechanically superior. They are also a hair better optically than the Meade and Celestron zooms, but we must reiterate that, visually, these zooms are all similar. In both terrestrial and astronomical viewing, what we could see through one of these zooms, we could also see through the others at the same focal length setting. Our conclusion is that, for general-purpose zoom applications, most purchasers will be pleased with any of these eyepieces.